Prophecy has been under continuous development since before 1998! This page was created in June 2013 and summarises the changes to Prophecy since then. 27th March 2019 11.0.0.8 Improved graph layout - x axis label font a little larger. Title box font scaled down for very long titles so that box does not extend off-screen. Forecast bias table at the bottom of Prophecy accuracy analyses now deploys ' heatmap' colouring to aid interpretation and adds cumulative data columns to the table. 27th February 2019 11.0.0.5 Minor improvements and fixes to Statistics View and Forecast Wizard. Improved time labels in Prophecy Advisor text for databases whose years are not Jan-Dec. 'Copy from Statistical Forecast' button added to Statistics View. Fully automatic mode forecasting using R forecasting models with zero exposure to the complexities of R. Click here for demo! For R experts, a two-stage round trip through R. For stage 1, Prophecy generates a templated R script file and a sales history export file for R to read in. It then loads the script into RStudio, the open source R IDE. The R expert can then use all the facilities of R to analyse, graph or report on their data, as well as to generate a forecast. For stage 2, this forecast can be brought into Prophecy and written to the Prophecy database. Click here for demo! Please visit the Prophecy R forecasting microsite via this link. Please read our January 2019 Newsletter which describes the new R feature here. In addition, there are a number of small optimisations, tweaks and the addition of a 'dark' theme to the 'Styles' menu, accomodating the 2019 'zeitgeist' for dark themes. 11th May 2018 10.0.1.0 Speedups, cumulative fixes and minor improvements release. A comprehensive Trade Promotions Planning module, which is fully integrated with Prophecy's standard sales forecasting features. To hold Budgets (replacing existing Budget type 'facts'). Holding Budgets in ad-hoc versions means you can have more than one Budget active and gives performance improvements to all Prophecy reports which do not display Budget data. For 'what-if' or scenario modelling. No need to clone the database and compare the 'what if' with the live, side by side within Prophecy. Multiple calendarisation transformations. The forecast can be displayed in any alternative calendar - such as calendar years (for Prophecy databases which default to fiscal years), weeks from a Prophecy database which uses monthly time buckets or any customer's unique calendar. Automatic 'My Customers' customer attributes. Use the Prophecy Attribute Selector to instantly select your own customers (i.e. those you have read-write rights to) and create attribute subtotals of 'My Customers'. 9 new colourful themes for the Prophecy Client application. Numerous performance improvements and fixes. Please see the expanded version of this list, including screenshots, by following this link. For customers with Prophecy years which are not Jan to Dec there are some new database configuration settings which will make years in Prophecy labelled "2016-17" or "2016-2017". The 'Autosize to widest' option on the right-click menu in Prophecy reports now supports an additional shortcut key. If you hold Shift and click the option it also auto-sizes the row labels (as well as the numeric cells). If you hold Shift and Ctrl then the column widths will be sized to optimise the column label cells too. Nested label format rules now work on columns as well as rows in Prophecy reports. Cells with currency symbols would previously copy to the Windows clipboard with these symbols included. Now the currency symbol will be stripped, making Excel accept the cell as a number and not a text value. This release supports multiple 'available from' / 'discontinued from' dates per individual sku, a much-requested feature from some customers. Secondly, if you try to log into Prophecy whilst your database manager is running a Prophecy maintenance script (which is not a good idea!) you will see the 'Supervisor Message' window, as previously. However, if you leave the 'Supervisor Message' window displayed then Prophecy will wait until the database management script has finished and then automatically continue whatever database activity you were running, providing that the structure and content of the database have not changed. If the structure or content of the database have changed then the only safe option allowed is to close Prophecy and re-login to the database. Therefore Prophecy will notify you that it needs to close and then close automatically. These changes improve the security of Prophecy Client and Database Manager interaction. Although it is inconvenient to have to log out of the database when you want to use it, database maintenance really needs exclusive access to your database and should be undertaken when everyone is out of Prophecy. The improved cooperation between the Prophecy Client application and database scripts in this update simply better protects the integrity of the database in cases where there are users logged into Prophecy during a database maintenance script. In addition, there are all the latest performance and stability improvements. 'Specials' on the Product and Customer Selector has been renamed 'Data-driven' to better describe its function and to reflect the new functionality that has been added to this feature. Now you can set a data-driven drilldown script to ensure that, when you drill down, you only get to the child items that have sales or forecasts. In fact, the 'rule' can be fully customised for you by your database manager, using simple SQL. Please view a YouTube video which demonstrates the new feature in action by clicking this link. In addition, there are all the latest stability improvements. Big new feature! With an appropriate data source you can now graphically view the promotional program for the item(s) you are forecasting alongside the forecasts in a new Gantt-style view. For Prophecy databases hosted in SQL Server, Prophecy will now endeavour to reconnect to SQL Server in the event of a dropped connection. If you suffer a disconnection Prophecy will offer to retry connecting and then resestablish the connection if it can. Dropped connections occur due to wifi disconnects, computer going into hibernation or sleep or for other network disruptions. Please note that reconnection only occurs for the actual Prophecy database and not for any other connections that Prophecy may have initiated - e.g. to a tracking database or SQL Nugget source. However, it does mean you shouldn't lose forecast changes in the event of a disconnect. This is largely a maintenance release to align the existing 32 bit Prophecy code base with the new 64 bit version, which was launched today. 64 bit Prophecy is 15%+ faster and can load much larger Prophecy reports. 19th March 2015 ,20th March 2015, 31st March 2015, 8th April 2015, 10th April 2015. 9.10.15.5 This is an important maintenance release for Prophecy. The Prophecy report files and database configuration files are being changed to a more modern file format : zipped XML. This is the same format used by Microsoft Office from Office 2007 onwards. If you are working over a slow VPN connection to Prophecy you should see an improvement in Prophecy's initial startup time. However, the main benefits from this 're-plumbing' will come in the future because it opens up the possibility for much more ambitious enhancements to Prophecy. You should notice no differences to your Prophecy experience as a result of this underlying 'plumbing' change, other than at the beginning, where you may see a message from Prophecy telling you that a report library needs to be converted. This conversion will happen automatically and quickly - the message is for information only. Thereafter, your Prophecy will be loading the converted report library files rather than the original versions but the ongoing experience will be identical to before the conversion. This release also includes a couple of fixes and a possible performance enhancement for SQL Server Prophecy database users. New! The 'Magic Themer' tool on the 'Format' tab of Prophecy has been extensively redesigned. It now contains a slider control that provides unlimited control over the overall lighness shade of the theme that is generated. It also offers either different shades of the fixed cell colour as a theme variation (which may be more pleasing to the eye) or alternatively it uses colour theory to apply colours that are complimentary to the fixed cell colour. Please give it a try - it's the fastest way to turn a plainly formatted report into one which is a little more 'designed'! Assorted minor fixes and improvements. 17th December 2104 9.10.12.2 Fix to address very long scripted selection text in replaying reports. The space allowed for the script in the saved report file has been doubled. Long selection script text only occurs when the sort order for the item being selected (i.e. products or customers) is 'None' because the original order of items has to be saved in the script text. For any other sort option (e.g. as hierarchy or alphabetical) the original order is not necessary because the items can be ordered using the sort rule when the report replays. 11th December 2014 9.10.12.1 A couple of fixes to incorrect behaviour on the report Navigator (binoculars icon ) which were introduced in V9.10.12.0. New! Create scripted subtotals of customer or product attributes on the Attribute Selector with a single click. New! Create scripted subtotals of ALL attribute values on the Attribute Selector with a single click. New! Product and Customer Subtotals Manager option. Just right-click on 'My Subtotals' or 'Database Subtotals' (if you have rights to manage 'Database Subtotals') or any individual subtotal item in the tree and select 'Manage Subtotals' from the popup menu. You can then multi-delete subtotals or move groups of subtotals between 'My Subtotals' and 'Database Subtotals'. New! The 'Search' product or customer dialog now also searches user-defined product and customer subtotals in 'My Subtotals' and 'Database Subtotals'. Click this link to view a youtube style movie of the new features in action within your browser! Updated : You should notice an improvement in the speed with which Prophecy reports replay. Fixes : this release contains several fixes for unusual report definitions or reports containing over 32,000 rows. 28th October 2014 9.10.11.0 When you Alt-Tab away from Prophecy and then back the Prophecy report cell you were previously on retains the 'focus' so you don't have to click on the window to restart using Prophecy. Added real-time messaging from the database manager to advise on things like future Prophecy maintenance, the addition of new items etc. Also added some minor stability features. SQL Nuggets now support 'Filter by Selection'. Keywords added which make providing a 'universal diary view' simple - i.e. to display a view of the diary entries for all the parents and children of the item at the current cursor position in the Prophecy report. (Note: this is only available in databases hosted on SQL Server.) Therefore, whilst viewing a 'brand' in Prophecy you can see all the diary notes for all the skus within that brand. Or viewing skus, you can see diary notes that were entered at the parent brand level. Scenario files now saved as zipped xml format files. These files are much smaller than Prophecy's original file format for scenarios. Export to Excel now handles Prophecy report pages where all data rows are filtered out (because they contain zero data and the appropriate dimension filters have been set). Export to Excel now correctly restores label rule formatting in report after export has completed. Added "Don't paste negatives" and "Paste as Using Displayed Decimal Precision" options to Forecast Wizard option. Statistics view also generates forecasts at displayed decimal precision of the fact being statistically forecasted. Time subtotals file format changed to XML (when saving as a file in Time Subtotals dialog box). 'Publish to File' option implemented for SQL Server hosted Prophecy databases. Conditional Format saved files now in XML file format. 9th May 2014 9.10.5.15 Added 'Paste' button to product and customer selector dialog boxes. Say you've copied a selection of product or customer codes from another application to the Windows clipboard and wish to see them in the selection in Prophecy. All you have to do now is click the new 'Paste' button and the items will be magically added to the currently selected items in the right hand list of the product or customer selector. The paste logic is able to ignore any codes or other text which cannot be found in the database - it simply parses the clipboard text into separate fields using a selection of delimiters (i.e. commas, semi-colons, tab characters etc.) and then tries to find each field in the hierarchy. If found, it adds it to the selection! Note: the logic always looks for codes that match, irrespective of the current label format selection in the dialog box or Prophecy report. 7th April 2014 9.10.5.14 'Parallel Years' Quick Graph option now displays (optional) moving average series lines. Moving average series lines are now optional (i.e. can be switched off) on all relevant Quick Graph types. Moving average series lines now drawn with a dotted line for added clarity. Internationalisation fix on 'Export to Excel' feature for non-UK geographies. The Product and Customer Label Builder option now works more effectively when using properties of the item's parents. There should be no duplication, for example when the label includes the item's parent and you are showing 'Total Products' or 'Total Customers'. You can 'paste' a selection of codes from another application into the product or customer selector by copying them to the Windows clipboard. Then, in Prophecy, you can hold down the Ctrl and Shift keys simultaneously and click the select button (the right arrow button). Any codes or other text in the clipboard contents which do not exist in Prophecy are simply ignored. The 'paste' will work with most common internal clipboard delimiter formats such as tab characters, commas, and carriage returns. Fixed zero-day crash on Facts selector when changing label formats and then reordering facts. 1st January 2014 9.10.5.1 A more modern font is used if the Windows version supports it (i.e. Vista or later). Export to Excel feature speeded up as it was found to be noticeably slower when interoperating with newer versions of Excel. Various minor improvements and bugfixes. 6th November 2013 9.10.4.3 Previously, copying from cells which contain currency or other text characters would not paste correctly into other cells. This has now been fixed! 22nd October 2013 9.10.4.2 Added small buttons to Save/Update report dialogs which let you see the list of products and customers which will be saved in the report if you save/update the report as a list-based (rather than script-based) report. A couple of fixes for non-customer-reported issues which Data Perceptions discovered during recent testing. 12th September 2013 9.10.3.2 Prophecy data entry rules now display more appropriately for all types of cells and Prophecy options. For example, features like the Forecast Wizard, 'Paste All' option could previously potentially trigger a rule volation box for every cell in the target range. With this improvement a single advice dialog will appear at the end of the process. On the 'Open a Prophecy Database dialog box, click the 'Edit database' button. On the 'Common Settings' tab, specify or select the report personal file you want to use for this database. Note that if you change your personal reports filename the existing file is retained and can be reverted to at any time. This option lets you share the same personal reports file with another user or in more than one Prophecy database. Added 'Very Long Label' button to Label Builder option on product and customer selector dialog boxes. Multi-cell data entry tool positions itself so part of it does not disappear off screen for some cells. Diary editor window positions itself so part of it does not disappear off screen for some cells. Public domain Libraries are now also copied to a Takeaway Database. Magic themer now remembers your preferences for always showing a white background and white text on fixed cells. Various bug fixes, performance tweaks and stability adjustments. 17th July 2013 9.10.2.1 Maintenance release - contains several fixes and performance tweaks. 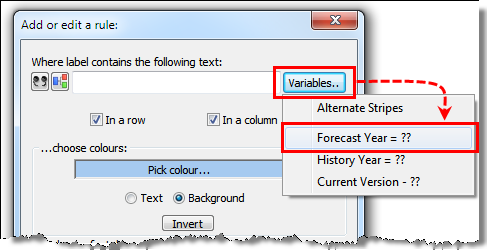 26th June 2013 9.10.1.1 Several 'variables' have been added to the Conditional Formatting, Label Contents functionality ('Format' tab in Prophecy --> 'Label contents' button). They make it easier to set up rules which match against Prophecy years or forecast versions. The 'Label contents' rules feature allows you to introduce shading into your Prophecy reports, which persist on axis reorientations, drill downs and changed item selections. For example, say you want cells for year '2013' to be highlighted using a different background colour in order to make current year data more visible. You would create a label rule which matches the text '2013'. Any rows or columns with the text '2013' will then be painted with your specified background colour. But what happens next year - i.e. when current forecast year is 2014? Presumably you would want '2014' to be highlighted instead? Previously you would have had to edit the rule so that the text to be matched is changed from '2013' to '2014' and then updated the report in the Prophecy Reports Manager. As you can see from the Variables menu in the previous screenshot, there are additional variables which allow you to match against history years and also forecast version labels. Press F1 for help when you are on the 'Add or edit a rule:' dialog box for more information on this powerful feature! 5th June 2013 9.10.0.1 New quick graph type plus enhancements to Takeaway database generation - see https://www.dataperceptions.co.uk/whatsnew-quickgraphs.php for more information.